One of Western Michigan University-Cooley Law School’s oldest and finest traditions is presentation of the Distinguished Brief Awards. Since 1985, Distinguished Brief Awards have been given in recognition of the most scholarly briefs filed in the Michigan Supreme Court, as selected by a panel of eminent lawyers, judges, and faculty members. Two or three briefs are chosen annually and are printed in their entirely in the WMU-Cooley Law Review. The award reflects the law school’s longstanding commitment to teaching and celebrating effective legal writing. Of the nearly 100 Distinguished Brief Awards made over the years, one given in 2012 was particularly prescient. That year among the award recipients was Bridget Mary McCormack, then Associate Dean for Clinical Affairs and a clinical professor at the University of Michigan Law School. Dean McCormack’s award-winning brief was on behalf of the Michigan Innocence Clinic. It was filed in support of an individual convicted of felony nonsupport who was denied the right to assert inability to pay as a defense. 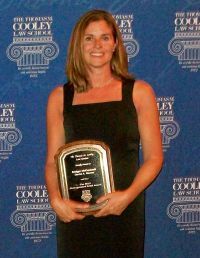 McCormack received her award at a banquet on July 11, 2012; later that same month the Michigan Supreme Court ruled in favor of her client in People v. Likine, 492 Mich. 367 (2012). That doesn’t always happen. Sometimes the best advocacy is in a losing cause. The prevailing brief is reproduced in Volume 29, Issue 2, of the Law Review. Winning the Distinguished Brief Award, and having the Michigan Supreme Court rule in her favor, turned out to be preludes to an even greater honor that year for McCormack, as in November she was elected to a seat on the Court. Now, six years later, on January 9 of this year, McCormack was unanimously chosen by her peers on the court to be its Chief Justice. Her selection is not a first for the judiciary; a woman has headed the court systems of 40 states since Chief Justice Lorna Lockwood of Arizona became the first to do so more than 50 years ago. But her selection is a first for Michigan in two respects. Several states have had multiple female Chief Justices, but no state can match Michigan’s six: Mary S. Coleman (1979-1982), Dorothy Comstock Riley (1987-1991), Elizabeth A. Weaver (1999-2000), Maura D. Corrigan (2001-2004), Marilyn J. Kelly (2009-2010), and now Bridget Mary McCormack. And this is the first time in Michigan history that the Governor, Attorney General, Secretary of State, and Chief Justice are all women. “You have to get us to take the case. The leave-application stage is truly the critical stage. “Play it straight. Communicate that you understand the Court’s role. We do not care who wins. We want to get the law right. Chief Justice McCormack’s remarks in their entirety are printed in Volume 31, Issue 2 of the WMU-Cooley Law Review. Kudos to the legions of law review students who have administered the Distinguished Brief Awards for 33 years. And to the eminent lawyers and judges who have participated in the selection process. 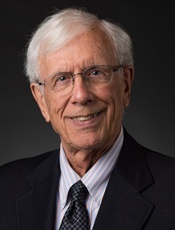 The author, Otto Stockmeyer, is a Distinguished Professor Emeritus at Western Michigan University-Cooley Law School. He is a past president of Scribes-The American Society of Legal Writers. His article on trailblazing women Chief Justices is available on SSRN. Professor Stockmeyer’s earlier WMU-Cooley blog posts are archived here.